LakeFeperd is one of the most prominent figures in the Sonic fan game community. With three great games under his belt, he’s now turning his attention to a more original creation: Spark the Electric Jester. We sat down with him to discuss his new project and what led him down that path. TSSZ: So you’re well-known in the community for three high-quality Sonic fan games. How does it feel to know that so many people have enjoyed your work? LakeFeperd: I don’t really know how I should feel about it. Even though that’s great, I can’t help but to think of what’s ahead of me instead of looking at the past. Even though Sonic After the Sequel and Sonic Before the Sequel were quite popular, that popularity is not going to transfer over to my other works as shown by Sonic Chrono Adventure and now by Spark the Electric Jester. Maybe I just got lucky with ATS and right now, I need to work hard in order to even reach one-tenth of the audience ATS reached. TSSZ: Speaking of Spark, what led you to move away from Sonic games into more original territory? Was there any one reason that proved particularly motivating? LakeFeperd: If I want to make a living out of this, I’ve got to start making original content, but I really don’t think there is a solid reason why Spark isn’t a very Sonic-inspired game like Freedom Planet. I just wanted to make an original game, but still, to me, making Spark not like a Sonic game was not a priority. TSSZ:Where did the idea for Spark come from? How did you go about creating the character and the world it inhabits? LakeFeperd: For the game’s mechanics, I used the new things I did for my past games as reference. The knockback from firing a charged shot is actually from a special transformation in Chrono Adventure. The controls are a middle ground between regular Sonic and Polem Sonic from Chrono Adventure, and I can’t deny that beam Sonic from ATS didn’t had an influence on Spark’s design. 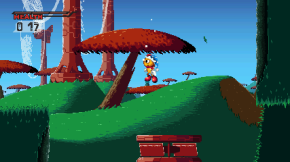 For Spark’s world, though, well, it’s kinda hard to say since I’m still building it as I work on the game’s stages, but what I can say for now is that Spark’s universe is probably much more based off today’s world than other games of the same genre or style (90’s mascot platformer). Although, the visual design for buildings and landscapes are, in bits and pieces, from games I played throughout my whole life. TSSZ: Can you talk about how developing Spark differs from other projects you’ve worked on over the years? Do you find that your process is any different this time around, or is it largely business as usual? LakeFeperd: Not really. My only problem right now is that I have much less time to work on my projects than I did before, but I’m still going by my old game developing philosophy, which goes something like: “Make it a finished product before making it a good product.” This isn’t really a big deal, though, since if something is to go public, I make sure that it’s good enough before it’s released. TSSZ: Is there anything specific beyond “a good, finished product” that you’re looking to achieve with Spark? LakeFeperd: After I make Spark a good product as a whole, i’ll start to look into making it into a great product if I can…if that makes any sense. TSSZ: It does. Last question. What excites you the most about working on Spark? Is there any one part of the game you’re looking forward to working on the most? LakeFeperd: The parts which I look forward the most usually are the visual and the level deisgn of a stage. Designing the way the tileset will work, how the parallax will be presented, those have always been very interestings things to work on. TSSZ: Sounds good. Best of luck with Spark, I hope everything works out!